Andrea Crawford got her start growing greens in the early 80’s for Chez Panisse. Today she operates Kenter Canyon Farms, selling mostly wholesale greens, including 20,000 pounds of oregano per year to Chipotle. She recently launched a bread line using wheat from her farm. The bread is baked, milled, and harvested using three varieties of wheat. The grain is stone milled and sifted to remove some of the bran. Developing more drought tolerant food plants, actively collecting and saving seeds and plant material from open pollinated varieties, commitment to sustaining genetic diversity. Home roasted black coffee, Roan Mills whole milled, whole grain bread, toasted with homemade jam and butter and a poached fresh farm egg. 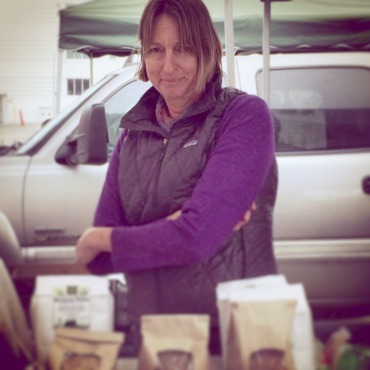 Tags: Andrea Crawford, farmer, farming, farms, Kenter Canyon Farms, local, produce, profile, Q&A, sustainability, sustainable foods. Bookmark the permalink.